A few weeks ago, my Brazilian flat mate showed a video to me. There were people performing a rain dance called ‘chuva’, meaning rain in Portuguese, in front of the São Paulo Museum of Art. She said that the people in the video performed the dance wishing to end the long drought in Brazil which is experiencing a serious water shortage. At that time when I came to Brazil, I did not notice how serious the problem was, but I realized it soon, after I faced blackouts several times a week. 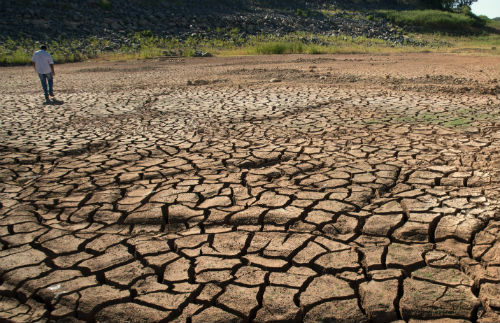 Since the 1930s, the worst drought has hit Brazil. São Paulo, the largest city of Brazil and the economic hub that has a population of nearly 20 million, are about to run out of water. São Paulo’s reservoir levels in 2014 were the lowest on record even in its rainy season. According to the water utility company Sabesp, the Cantareira reservoir system, which is the largest of six reservoirs that provide water six million living in the metropolitan area of São Paulo is down to six percent of its capacity. The experts are warning that if it rains less than half the long-term average in the next few months, Cantareira will dry up by July. The water shortages impact all consumers including not only households, but also large commercial consumers such as the petrochemical, steel, ethanol and textile manufacturing industries in São Paulo state. These industries consume about 70 percent of Brazil’s total industrial water use. As a result, industrial production and services in restaurants, schools, and even hospitals have been steadily declining. According to The Telegraph’s recent report, doctors have been forced to cut short dialyses treatment for kidney patients. Drought conditions have also hit agriculture. Soybean crops have already seen irreversible yield damage and forecasts for this year’s coffee harvest are considerably lower than last year, causing global Arabica prices to rise 50 percent over the year even as most other commodity markets have tumbled. As the drought gets worse, this disaster is spreading from São Paulo to Rio de Janeiro and Minas Gerais states in southeastern Brazil. According to the Federal Water Agency, the main reservoir in Rio de Janeiro state is operating at zero capacity, although officials have noted plans to divert water from other sources to prevent rationing by July. In Minas Gerais, officials have asked companies and residents to cut back water usage by as much as 30 percent. Brazilians have said that the water shortage has been caused by local and state officials through poor planning and failing to upgrade municipal pipe systems. A government agency reported that 37 percent of treated water was wasted in 2013 because of pipe failure before it even reached residents’ taps. Even though the officials have a responsibility for its consequences, the drought is not the all their fault. Analysts have highlighted that São Paulo creates a heat island reducing rainfall in its surroundings. Also, imprudent deforestation made water, once captured by trees and funneled into reservoirs, to now become in mudslides. The average consumption of water by residents of São Paulo is roughly 200 liters a day, whereas it is just about 150 liters in much of Europe. So as not to let this crisis get much worse, the São Paulo state government began providing financial incentives for those who use less water during off-peak hours. But if some customers consume water above the monthly average consumption rate, they will get a double bill. It also has been reluctant to admit that water rationing, up to five days at a time, would be necessary. Despite usage declining by 17 percent, larger decreases will be needed and it is still unclear when and how rationing might be implemented. In addition these conservation programs will impact only areas served by the Cantareira system. Nevertheless there is some relief in sight. Brazil is still in its rainy season. Some reservoirs such as the Rio Claro, Alto Tiete and Rio Grande have seen slight increases in their volumes in recent days. Will Brazil face ending of the drought with the rain dance?